Discussion in 'Disney Trip Reports' started by Jenny Sanders, Oct 14, 2018. 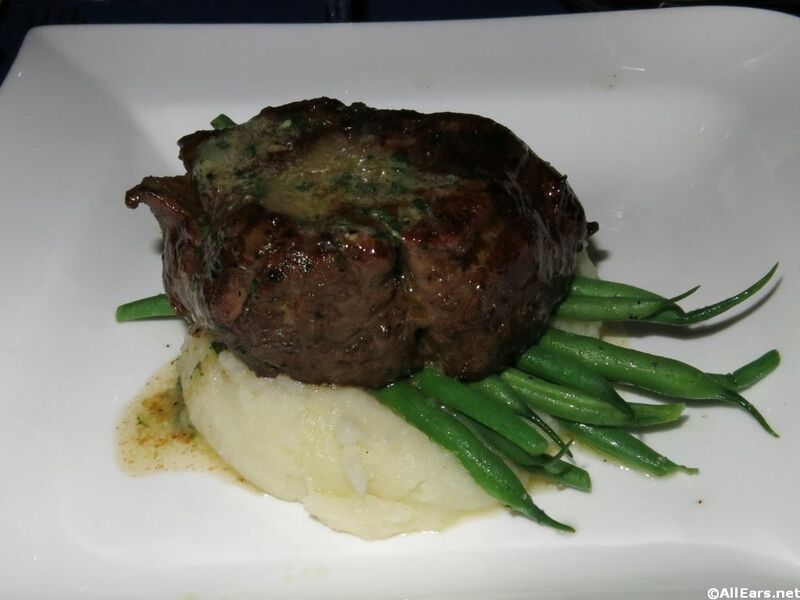 For our main entrees, I ordered the Butter-Poached Twin Main Lobster Tails - Brentwood corn souffle, malted popcorn sauce, jumbo asparagus, citrus gremolata $69 and Joe had the Grass Fed Filet Mignon, - Boniato- potato mash, broccollini, with red wine-oxtail reduction $52. Both of these meals were cooked to perfection and we enjoyed them immensely. Gia had a bowl of mac and cheese with a side of fresh fruit. buzzrelly, ariane37, StarWarsMomofGirls! and 2 others like this. Believe it or not, we had room for dessert...I had a dessert special. I apologize ahead of time. I have no idea what it was. But, I will say it was some sort of pudding...But, it had a different consistency and was more like a cake. That I remember...Joe had the Mango Sorbet, a no sugar added dessert - with Melon, Pineapple, and Berries $11. Both of our desserts were excellent. Our waitress noticed Gia's birthday button and brought her out the most adorable Finding Nemo cupcake. We even sang Happy Birthday to her and she got to blow out the candle on top of her cake. She loved this!!!! buzzrelly, Terra Nova guy, StarWarsMomofGirls! and 2 others like this. Loving your pics of POR. We tentatively have a reservation for there in February and it certainly looks beautiful. The food looks really yummy, I love shrimp so both appetizers get a thumbs up from me! What a cute Nemo cupcake for Gia, I have never seen that one, so nice for her! I have to say, Narcoossee's is one of my favs. I totally think you should go back!!! We love shrimp too and both were delicious! Everything looked really good at dinner! Might need to add that to the list. Gia seems like a very well behaved little lady! Narcoosse's is one of our favs. Service isn't always the best, but the food has always been very good. buzzrelly, ariane37, Terra Nova guy and 3 others like this. We were able to sleep until about 8 this morning. So, we took our time getting ready. We showered, got dressed and walked over to the car. It was a short drive back to the Grand Floridian (remember, we were there for dinner last night). Today, we had 9:30 am reservations at the Grand Floridian Cafe for breakfast. buzzrelly, kastoney, ariane37 and 2 others like this. My family did this too during our POR stay. It was enjoyable. It made me want to stay at POFQ too. That resort seemed more quaint, I guess because of the smaller size. She returns with a new drink for me and tells me that the bartender says, now get this...I'm not tasting the alcohol because there's rum in my drink. Huh, really???? Ummm...ok? that's just weird. I drink rum almost exclusively. I've made my own cocktails with almost the same ingredients as your drink. You can taste the alcohol...if you do it right. I can see why you were disappointed with your meal. POFQ is actually one of my favorite resorts. We've stayed there 5 times and each time has been very nice. I highly recommend it. The carriage ride really looks so enjoyable, we would see these at our stays at POR and POFQ but never have done one! So sorry your GFC breakfast and drinks were not good. Weird about the drinks, I suppose now because the drinks are part of the DPP some places will really skimp on the alcohol to save money! Not cool, the drinks do look pretty! It's a great way to wrap up the day. We woke Gia up from her nap at about 2:45. Our plan was to be at the bus stop by 3:15 (Oh how I dread the buses). But, we did it. We took a quick pic of Gia in the room with her Minnie candy bucket, packed up the stroller and were on our way to the buses. When we arrived, the sign said a MK bus would be along in about 15 minutes and it was pretty accurate. As we were waiting, the wind picked up and the skies started to darken. As soon as we loaded the bus the skies opened up and the rain came down...I was so nervous we were in for a stormy night. But as soon as the bus pulled into the MK, the rain stopped and the skies brightened. Horray!!! It turned out to be a beautiful night. Where will we have dinner and what comes next??? buzzrelly, kastoney, Terra Nova guy and 1 other person like this. I love the white sangria at Narcooses! What an awesome meal! What a bummer about GFC. Theres nothing more frustrating to me when a waitress gives off a mean vibe when youve clearly done nothing wrong. Crazy about the drinks too! Like you'd think you'd taste some alcohol in there lol at least they looked pretty! We love Narcoosees! And yes, it was an AWESOME meal!!!! Oh, how I can still taste those tails. YUM! Whaattt?!?! That is bizarre. I mean you can taste alcohol! Oye. s soon as we loaded the bus the skies opened up and the rain came down...I was so nervous we were in for a stormy night. But as soon as the bus pulled into the MK, the rain stopped and the skies brightened. Horray!!! It turned out to be a beautiful night. She is so cute! And Ready to go!!! The girls LOVE it!!! One is in Pre Med and the other is in Public Policy/Marketing. What is your son majoring in? So happy your girls are doing so well!! Jack is doing an honours degree in Applied Computer Science. He will pick a double major next year but for now is taking a bunch of different classes to get a feel for his second subject. I had paid for a standard view (parking lot), but were extremely surprised when our room was directly across from a courtyard with a fountain!!! It was absolutely beautiful!!! Awesome looking meals! Joe had the same meal Bill had when we ate there back in 2016. I always love Narcoosees! Oh no! What a shame! really not a good meal at all and made even worse by the bad service. She obviously thought we were novice drinkers...LOL!! !